I feel like I am still waiting to open my mailbox and see the next issue of my dear Domino in there. It still hasn’t sunk in that it’s never coming (* stifled sob*) The Domino Book of Decorating has helped ease a bit of the pain, and if you don’t have a copy yet, here’s a chance for you to get one FREE! E of S has two copies of the Domino book to give away to two lucky readers….but not that fast! You gotta work for it people! So dust off your creative thinking caps and give either of these contests a try. One winner will be picked for each contest and announced April 6! So get your inspiration boards to me by then by Friday April 3 by e-mailing them to [email protected]. Choice 1: A longtime fave of mine using turquoise and green and mixing modern and traditional elements. Choice 2: Mary McDonald’s graphic guest house kitchen. Choice 3: Jessie Randall’s (of Loeffler Randall-swoon) modern and light living room. 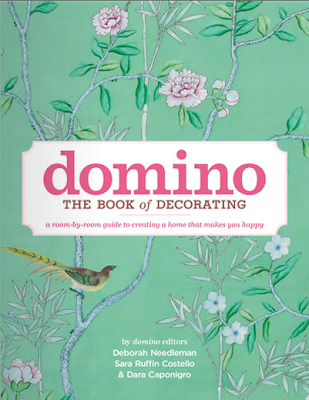 CONTEST #2: Design a whole room (doesn’t matter what kind of room) based on the GORGEOUS cover of the Domino Book. It’s a beauty! Good luck and I can’t wait to see what you come up with!!!! Erin, Please show what people come up with! Oh my goodness, how fun is this!? I definitely want to play. Great contest, Erin! Well I am bored at work today and you just gave me something fun to do! Thanks! I cannot wait for you to post the winning looks!! I had NO IDEA that my beloved magazine had folded! I am a magazine addict and it seems that every other day one of my favorites is closing up shop. Ugh. Any suggestions for a good replacement for Domino that I may not know about? What a fun contest!! Hope I can find some time to take part and I can’t wait to see what others come up with! Yes, count me in. I love this! Please post these boards after the contest is over!! Great idea — this is going to be fun! Does anyone know where the first picture is from – I am interested in the ceiling fan with pendant.